Despite having burned its fingers with export processing zones, which mainly involved a number of substantial fiscal benefits, the government has gone into overdrive to push its new policy on special economic zones. The difference, this time around, is the gargantuan scale on which the project is being pitched. Setting up these special zones entails land acquisition on a massive scale -- and, therefore, displacement on an equally massive scale. Much of the land involved is fertile, agricultural land, though the government has now said it will only acquire wasteland. This is a somewhat disingenuous policy shift, given the fact that it is extremely difficult to identify whether a piece of land is indeed waste. Wasteland, moreover, is, par excellence, the resource on which the poorest and most marginalised depend -- and, clearly, the government is gearing up to take over large swathes of common property resource land by designating them 'wasteland'. The scale of the special projects has united farmers who risk losing their land. And protests, some violent, have already started breaking out. The outlook for the future is grim. In their struggle against the state, the farmers have the support of sections of the political class and intelligentsia, and civil society organisations. But their most powerful ally, strange though it may sound, is the Union ministry of finance and the associated fiscal establishment, including a number of think tanks. The finance ministry raised objections to the ambitious programme on the ground that it would lead to the loss of an unconscionably large chunk of the government's revenues. Independent observers have also pointed out that special zones may not bring in new, big-ticket investments, as hoped, but only encourage the flight of old capital to these enclaves. Moreover, they say, the special zones are in effect piggy-backing on public resources -- the taxpayer's money. But despite opposition, the special zones programme is steaming ahead. A farmer in Cheete Kalan village in Amritsar, Harjeet Singh Hundal, has big plans. For the past year, he has been using organic manure on his fertile and irrigated agricultural land and he can't stop talking about it. dlf Universal, the big hitter in real estate, also has big plans. It wants to build an approximately 500-hectare (ha) special economic zone (sez). Unfortunately, Hundal's land is organic to their plans. It's right in the middle of the land the company wants for its new venture. The sez will comprise textile and garments industry units (spread over 162 ha), engineering units (142 ha), food-processing units (101 ha), a free trade and warehousing zone (40 ha) and an inland container depot and an air cargo handling space. It will also include commercial centres, residential areas and institutional facilities like schools and hospitals. dlf will invest Rs 800 crore in the sez to build an island of industrial growth where Hundal wants to make vermicompost the buzzword. The state has promised dlf it will acquire Hundal's 12 ha and the rest of the fertile land in the public interest. Hundal is not alone. Massive tracts of land are being acquired in the name of public interest and being sold off to private developers for sezs. The Union ministry for commerce and industries sees these zones as a big boom, boosting the economy through exports, building infrastructure and generating hundreds of thousands of jobs. In June 2005, the government passed the sez Act and in February 2006, framed rules. Till now, the Board of Approval (boa), which approves sez proposals, has granted formal clearances to 212 proposals and in-principle approval to 152, despite stiff opposition from the Union ministry of finance, the Left parties and the Reserve Bank of India. "I can't watch the fields I have tilled with my hands for so long get bulldozed"
The sez Act was notified last year. It provides for enclaves that will be given major fiscal concessions. Units in sezs will not have to pay import duties, state taxes on raw material, or cesses/duties on electricity. State governments have to assure sezs water. They will also get single-window clearances. The requirements on minimum area, processing area, social infrastructure and investment have been contested. After finance ministry warnings on revenue losses, the commerce ministry tweaked requirements for minimum processing area and investment to pre-empt real estate deals, but revenue concerns were not addressed (see table Mostly carrots). But sezs have an unfortunate genealogy. Earlier experiments with export processing zones (epzs) and free trade zones have not worked. India's first special export processing zone, the precursor to today's sezs, was established in Kandla, Gujarat, in 1965. In 1973 came the Santa Cruz epz in Mumbai. It was only in the 1980s that India set up five more such enclaves in Noida, Falta, Kochi, Chennai and Visakhapatnam. This was when both India and China were trying to open up to the world. In 1980, China passed its first sez law, setting up the Guangdong sez. Even though India was way ahead in conceptualising sezs, China has sprinted past (see box Elephant and dragon). China got the better start, because in the initial phase of special zones in India, there were policies to facilitate operations, but implementation was flawed and no procedural or legislative changes were made, even though performance began to slide (see graph Underutilised).Then the exim policy (1997-2002) launched the sez scheme in 2000, with the explicit objective of providing the back-up epzs had not been given. By 2003, epzs had been converted to sezs. There is a catch, however. The failure of epzs was not just about implementation failures. The aim of epzs was to promote exports and boost foreign exchange earnings. But as things panned out, epzs turned into zones in which value was merely added to semi-finished goods for exports -- what did not happen was the expansion of a manufacturing base geared towards external markets. Consequently, the expected growth in exports from India never took place. Even the comptroller and auditor general had pointed out in 1989 that epzs were meant to provide an internationally competitive environment for export production at low cost. The sez Act also says that the main objective is promotion of exports and creation of infrastructure, especially social infrastructure. 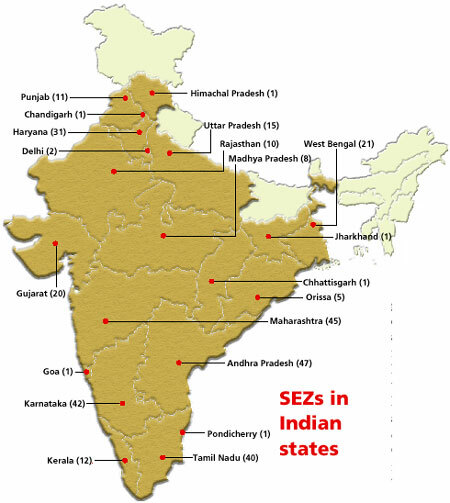 For a sneak preview into the future of sezs, one should review how epzs fared. 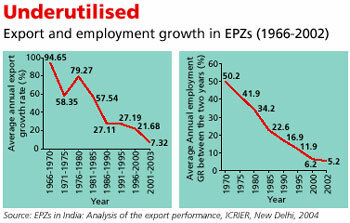 According to a report by the Indian Council for Research on International Economic Relations (icrier) -- 'Export processing zones in India Analysis of the export performance' (November, 2004) -- growth rates of aggregate exports, foreign exchange earnings and employment in epzs/sezs started falling since the late 1980s. The share of epz/sez exports in exports also stagnated. The share of epzs in total exports increased from 0.07 per cent in 1973 to 4.3 per cent in 2001. And in 2002, their share in exports was slightly lower at 3.8 per cent. The slowdown was despite the creation of four zones. "There is nothing about EPZs or free trade zones in India that should make us so enthusiastic about SEZs." Moreover, the number of units declined in many zones in recent years. The number of units that could be set up was much larger than the number of operational units. And although current zones, which are themselves not decently occupied, are much smaller than 400-odd ha (1,000 acres), policy is pushing for bigger sezs. 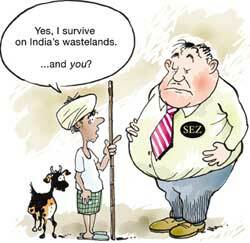 The epz report card only deepens misgivings over sezs, especially given their scale. Not surprisingly, it is setting off protests that can snowball into widespread confrontation. With sezs poised for take-off, real estate developers are clamouring to get their hands on vast expanses of land. The centre has given its blessings, final or preliminary, to 364 sezs. The euphoria notwithstanding, at the ground level, a period of intense contestation is brewing -- over land, between farmers who are going to be dispossessed and those who covet their only source of livelihood. G K Pillai, special secretary, department of commerce, insists that no farmer has been displaced. Most of the formal approvals and the issues of farmland acquisition and displacement are exaggerated, he argues. But it is important to note that out of the 212 formal approvals till now only 32 have been notified, with a total land area of only 1,723 hectares. This is a minuscule part of the land that has been or will be acquired for the 364 projects formally approved till October 10, which amounts to 147,224 ha, somewhat more than the area of the national capital region. Though land acquisition, even for projects that have not been approved, like the Reliance sez in Dadri, has been on since 2002, policymakers are yet to work out how large tracts can be freed. "The SEZ will create infrastructure for services, manufacturing and agri-business. The challenge for us is to think in terms of 'Team India', so we can compete globally with countries like China, Malaysia, Singapore, and Dubai." With such acquisition comes the issue of compensation. The centre has already said that a uniform rate is not possible. "The contract here is unfair since the land is taken over at the current rate or lower. But as soon as the sez starts coming up, the rates shoot up and the farmer who has been displaced cannot buy alternative land. 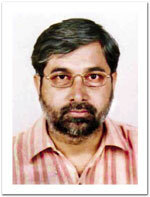 This creates further inequalities," says Bibek Debroy, secretary-general, phd Chamber of Commerce and Industry. The role of the state is proactive and widely perceived to be dodgy. In most cases, the state acquires the land from farmers under the pretext of public interest, using the Land Acquisition Act, 1894, and sells it to the sez developer. "Why is the state involved in acquisition? On the one hand, the state is unwilling to give subsidies to the farmers and, on the other, it intervenes to acquire land. If you say that you are going by the market, let the buyers and sellers negotiate. At least, be honest," says V P Singh, former prime minister and convenor, Jan Morcha. Ironically, the sez bubble and the land acquisition programme that accompanies it have starkly exposed the stratification in agrarian society. Most farmers' unions in Punjab that are collaborating to protest against sezs are headed by rich farmers; other voices are muted. "The voice of the landless labourers and of the most marginalised is unheard. The contest has been whittled down to the issue of compensation for landowners -- a fight between big farmers and industry. We are forgetting that the most marginalised in backward districts engage in single-cropping," says Mansi Asher of the National Centre for Advocacy Studies (ncas), Pune. Their voices are important because the focus of acquisition has turned to 'wastelands' -- the subsistence resource of the poorest. Acquiring wasteland for sezs has been touted as an acceptable compromise, but it begs several questions. Though wastelands seem to be in high demand, be it for jatropha plantations to get biodiesel (Planning Commission target is 11 million ha), or for plantations for the paper and pulp industry (the Confederation of Indian Industries has a target of 36 million ha) or, now, for sezs, identifying which tract of land is waste is problematic. Land classification in India is complex compartmentalising land into the categories waste and agricultural is not as easy as the commerce ministry imagines. Both these classifications have numerous layers within them. Wastelands, for example, can be land with scrub, grazing land, pasture, land on which shifting cultivation is carried out or even agricultural land locked within a notified forest (India has 55.2 million ha of wastelands). And, of course, there is the issue of people -- the poorest, most marginalised in the most backward of states -- who depend, for day-to-day survival, on these very 'wastelands'. Most of these lands provide firewood, fodder and other minor forest produce. Meaning, much of the land classified by the government as waste is actually common property resource (cpr). This makes market-based valuations nonsensical. The centre's own survey of cprs speaks of the rural population's dependence on them. According to the 54th round of the National Statistical Survey Organisation survey, about 15 per cent of India's geographical area is cpr, including community pastures and grazing grounds, village forests and woodlots, and cultivable wastelands. 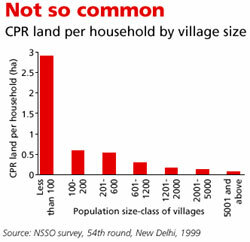 And 61 per cent of cpr land falls into the category of barren or waste land. It also showed that the average cpr area rural households were dependent on was 0.31 ha while the average area of land owned was 0.84 ha. The survey also explained that a lower average for cpr land meant more people depend on the same land and not that cprs were of lesser importance (see graph Not so common). Asher adds, "It is estimated that cprs contribute about 12 per cent to the income of poor rural households in India." As far as grazing goes, the survey added that while 56 per cent of rural households reported having livestock, 20 per cent of households depended on cpr land for grazing and 13 per cent collected fodder from it. The data also showed that the smallest villages were most dependent on cprs for subsistence. In spite of the importance of cprs, the area under them is constantly shrinking. The two fastest rates of decline were in the middle-Gangetic (7.2 per cent) and trans-Gangetic (7.1 per cent) regions, where the availability of cpr land per household was as low as 0.07 ha. And the pressure on the shrinking land is increasing. "The SEZ free run is politically very shortsighted. You are taking resources from the poorest and handing it over to the industry." On the surface, it seems very logical to hand over so-called wastelands for sezs. But the legal classification of wastelands in India is further enmeshed in the vexed question of the rights of people, or rather the lack of them. "I am worried that no one is talking about user rights of people over land, but only about owner rights," says Kanchan Chopra, director, Institute of Economic Growth, New Delhi. Asher explains the problem in the context of Reliance's sez, which will come up in Raigarh district, Maharashtra.Almost 12,000 ha in this district, known as dali lands, have been cultivated by tribal folks for decades. "The problem is that these tribal rights have not been regularised yet. But if the Scheduled Tribes Bill is passed then these people will get their titles," Asher says. As of now, these tribal people can be removed from their only source of livelihood and not be compensated. Like dali lands, there are mahoratan and gairan lands, which are classified as wasteland but are actually either allotted to landless dalits or are grazing lands. According to an ncas report, in Maharashtra's Marathwada region, gairan lands cover 231,300 ha, which is 3.6 per cent of the total area and on average each village has 230 ha of gairan land. "It is very hard to find contiguous tracts of land, not separated by grazing lands or watersheds. But that is exactly what sezs need," says Asher. Although in 2002-2003, chief minister Vilasrao Deshmukh, declared that all government wasteland should be for the landless and dalits, the centre today says sezs shall have first right over wastelands. The Adani sez in Mundra, Gujarat, is a similar case. The grazing lands for 10 villages out of the 23 acquired have been engulfed by this sez. Gujarat has about 577,284 ha of pasture. The common grazing lands were given away in spite of a state government order of 1973 that provides for 40 acres (16 ha) of pasture to be allotted per 100 animals per village. "This order was notified because of the scarcity of grazing lands in the state. However, a couple of days back the cabinet passed an order saying no agricultural land will be acquired but grazing lands will be," says Mahesh Pandya of Paryavaran Mitra. Again, more people are being pushed onto less land the pressure is building. Finally, the big question even if we are going to give away these 'wastelands', where are they (see table Waste variation). If we compare the states where most of the sezs have been approved and where most of the wasteland is located, there is no correlation. In fact, the comparison undermines any semblance of credibility to policy pronouncements about locating special zones on wastelands. Punjab, which has the smallest percentage of wasteland in India (2.33 per cent), has 11 approved sezs whereas Himachal Pradesh, with almost 51 per cent of its land as wastelands, has one sez. 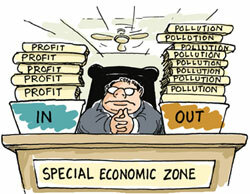 The number of sezs in Manipur, Nagaland, Mizoram, Sikkim, which have more wasteland than many other states, is zero. Apart from this, the numbers point to another problem skewed regional growth. Most of the sez proposals and approvals have come up in the more developed states like Maharashtra, Tamil Nadu, Karnataka and Haryana. Areas near metros and ports are in high demand for better infrastructure. Haryana, Maharashtra, Karnataka, Tamil Nadu and Andhra Pradesh account for 65 per cent of sezs approved. Bihar, Jharkhand, Chhattisgarh, the hill states and the northeastern states have been left out. freeing land for real estate through a back door"
It is because of existing regional imbalances that entrepreneurs are given incentives to invest in backward states, especially in the infrastructure sector. Be it Himachal Pradesh, Uttaranchal or the northeast, every state has an industrial policy to give a fillip to industrialisation and attract investment in sectors where the risk factor is high. More often than not, such policies include tax holidays, among other things. But stark inequalities were generated between the northern and northeastern hill states by these separate policies. Industries obviously preferred Himachal or Uttaranchal to Assam or Meghalaya because of proximity to cities and, of course, better infrastructure. The Himachal and Uttaranchal industrial policies virtually cancelled out whatever incentive the northeastern states were providing. As a result, the Northeastern Industrial Policy of 1997 failed (see 'Revamp, really? ', Down To Earth, July 15, 2005). It could not attract large-scale investment, creating some small and medium enterprises, especially those engaging in the finishing stages of manufacturing. These units came with low investment, low value-addition and low employment. Even within the region, the developed states, Assam and Meghalaya, attracted most of the investment (91 per cent). Again, it was better connectivity with the mainland, quality of infrastructure and logistics, which ushered in investment. Given the varied stages of industrialisation in our states, tax breaks won't help significantly in promoting industrialisation in the absence of proper infrastructural facilities. The sez experience, up until now, is already providing evidence of this. In all of the northeast, only Assam, the state with at least a semblance of an infrastructure, has received project proposals one for Sonitpur district and another for Tinsukia district -- one has been rejected and the other is on hold. Shantikam Hazarika of the Assam Institute of Management, when asked about sezs, said the odd industry may buy in but there would be no systematic industrial growth with sezs in the northeast. The approach paper to the 11th five-year plan doesn't offer any solutions. It says, "In a competitive world, investment must be allowed to flow to locations perceived to have an attractive investment climate and better infrastructure facilities. The primary responsibility for achieving balanced regional development within states must necessarily lie with the state government." This means that even the Planning Commission does not consider it necessary to address regional imbalances by offering central assistance to backward states. It's a policy frame that abdicates the centre's federal responsibilities and makes every state fend for itself, whatever its capacities. "If you look at the national map of National Highway Development Programme, you can see the clear focus from the north to the south, minus most of the centre and the east. Now, when you superimpose the sez impact on this, it is just going to explode," warns Debroy. But the farmers are not the only ones who have been protesting against these special zones. An unlikely but forceful voice has been that of the ministry of finance. Though the commerce and finance ministries had drawn swords over the issue of whether sezs will result in a revenue loss or increase in investment, they have now agreed to disagree. The finance ministry claims that the country will lose Rs 1,60,000 crore by 2010 in revenues, while the commerce ministry claims that sezs will rake in investments worth Rs 1,00,000 crore by 2007. "The question of whether we will gain or lose is impossible to know," says Debroy. The National Institute of Public Finance and Policy (nipfp), New Delhi, has very pointedly discouraged the kind of tax incentives being offered to sezs.It says perpetuating tax incentives for exports under the sez Act is questionable because the arguments that originally provided the rationale for setting up epzs and allowing tax concessions for export-oriented units have lost their force after liberalisation. Secondly, there is no evidence that tax benefits to special zones have helped promote exports. "The epz era was different. 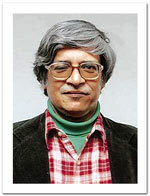 We needed them because we could not liberalise everywhere then," says Debroy. The nipfp report explains that special consideration towards exports was necessary when India's economy was heavily controlled and protected and epzs were conceived as 'islands' isolated from the restrictive environment. But in the liberalisation era, with no ban on import of foreign technology or flow of foreign capital, the extension of tax benefits for sezs seems uncalled for, constituting a needless drain on revenue. Not only are they unnecessary, concessions to sezs will create market distortions. Critics of sezs say tax concessions alone don't do much to attract new investment. "Investments are mainly attracted towards good physical and social infrastructure and not for fiscal incentives," says Debroy. The nipfp report also gives fiscal incentives a low ranking, saying they may be used as a convenient channel for routing profits earned elsewhere through sezs to escape taxation. nipfp estimates that the revenue loss may be nearly Rs 10,000 crore from income tax breaks alone and says that tax holidays under other heads are unjustified and should be terminated. "The biggest problem I see in sezs is that the incentives given are not linked to exports at all," explains Debroy, "Moreover, here you are giving full concessions (direct and indirect taxes) first to the sez developer to develop better infrastructure for units. Then why are you giving full tax holiday to the units again?" Also, the government claims that the entire infrastructure connected to the sezs will be built completely on private investment. "But indirectly this is public money. The revenue foregone in taxes could have been used for building public infrastructure," Debroy says. 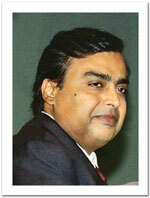 "There is some sense in providing tax holidays for setting up industry on backward regions. What is the point in giving tax incentives to develop infrastructure and then to the industry, too?" The commerce ministry's optimistic claims are entirely predicated on the expectation that there will be long queues for setting up new units and an infusion of new investment to these sezs. But the assumption that there will be significant volumes of new investment is questionable. "It is very logical that existing units will fly to these zones, given the ready infrastructure and tax benefits," says Debroy. Therefore, it will only lead to a clustering of export units which are at present distributed over the country. Another apprehension is specific to it sezs. Of the projects that have been formally approved in the last two boa meetings, 22 out of the 34 are it or it enabled services (64.7 per cent) and of the 32 sezs already notified, 19 are in that sector (59.3 per cent). The it sector has a tax holiday till 2009. The fear is that software companies will just migrate to these zones to avail the tax concessions after that date, without adding any new investment. "In the name of tax reforms, removal of exemptions and concessions is being encouraged. This step is regressive. They are not only messing up the fiscal regime but the land market as well," cautions Debroy. "If we want to provide better infrastructure and single-window clearances, then why not do it all over the country?" But leave alone developing infrastructure uniformly, the sez scheme looks set to exacerbate existing regional imbalances. This is clear even as project proposals have started coming in and approvals are being handed out. The internal structure of sezs and their relations with the world outside are equally controversial. Environment and labour standards followed inside sezs are suspect all around the world. Chinese sezs are particularly notorious for their lax labour and environmental standards. The sez Act has in its own way tried to loosen regulations on both fronts. Also, the new environmental impact assessment (eia) notification, which was passed this September, specifies significant departures from the earlier specifications on industrial estates. For one, it exempts industrial estates with an area less than 500 ha from obtaining clearances under this notification, whereas the 1994 notification exempted industrial estates of below 50 ha from eias.Units in estates with homogenous industries such as chlor alkali, leather, petro-processing and synthetic organic chemicals or those estates with pre-defined sets of activities (which effectively could mean all industries), will not be required to take prior environmental clearance (though the estate will if it is over 500 ha), as long as the "terms and conditions for the industrial estate/complex are complied with" and if they have "clearly identified management with legal responsibility". "Given that all industrial processes are anyway required to have a clearly identified management with legal responsibility, the objective of the specifically stated qualification is still unclear," says Leo Saldanha, Environment Support Group, Bangalore. In effect, these conditions could be applied to a large variety of industrial estates, sezs and biotech parks, thereby enabling large-scale exemption from environmental clearances and public hearings. Moreover, estates spread over more than 500 ha have the luxury of deciding whether an eia is required. The only regulation is self-regulation. The environmental performance of existing sezs does not provide succour either. A report of the Supreme Court Monitoring Committee (2005) shows that some units had been importing metallic wastes of various categories without being registered under the Hazardous Waste Rules on the plea that they are located in an sez. The report states "Despite the recommendations of the Menon Committee, the implementation of environment laws has still taken a backseat on the assumption that sezs are 'foreign soil' and need not concern themselves with such laws." There is a similar lack of clarity about the regulation of solid waste disposal in general terms. The case of the Bantala sez on the eastern fringes of Kolkata, prefigures potentially huge environmental hazards. The estate was conceived for the relocation of polluting tanneries within the eastern limits of the city -- Tangra, Topsia and Tiljala. Apart from the fact that a large number of units were loath to move there, clearly, environmental standards were lax in the extreme. The estate had made no provisions to accommodate an effluent treatment plant and hazardous waste was being discharged into a nearby canal. Crucially, the sez was located in the natural drainage basin of the city. Environmentalists claimed it was located wholly or partially in protected wetland areas, but their legal challenge was thrown out by the Calcutta High Court. The Bantala sez points to two fundamental problems that could surface once the special enclaves are up and running. The sez Act places the responsibility of providing water on the shoulders of the state.As of now, obviously, one cannot tell how this will pan out. But, clearly, this is a task that, given the form book, the state is incapable of. Since it cannot provide water to satisfy essential needs -- drinking, irrigation -- it is probably fair to question the state's capacity to provide the huge amounts of water that sezs will need. Will it come from existing supply sources? If it does, assuming a zero-sum game, someone is going to lose out. And that someone will obviously be the people, mostly farmers, who live in the vicinity of the enclaves. So, the likelihood is that not only will people lose their lands, they will also have to suffer a diminution of their already constricted access to water. Then again, there is the issue of groundwater extraction. The Act does not make provisions to regulate this. Given the reality of falling water tables, this sounds like a disaster in the making, given the scope of the sez rollout. That's just the input side. Let's look at the output side. Nothing in the sez Act, or the rules framed under it, makes any stipulations about the disposal of wastewater. Any assumption that all sezs will have effluent treatment facilities is likely to be misplaced -- as the Bantala case makes abundantly clear. And in the absence of regulatory provisions those living in the vicinity of sezs would be forgiven for fearing that poisonous effluents will pollute their lands. A bit of crystal-ball gazing exposes another extremely anomalous provision. 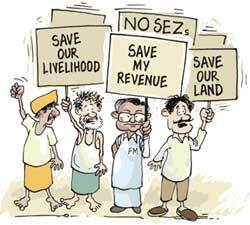 There is no mechanism in the sez Act through which the government can deal with a failed zone. The developer cannot sell the land and the government has few options because it can't utilise the land for any other purpose. This, even if the sez in question is manifestly unviable in given circumstances. Labour laws are no different. It is widely believed that cheap labour, free from stringent laws, is one of the most attractive features for prospective investors. In India's case, sezs have been granted the status of public utility services, which means that workers there cannot form unions, go on strikes or negotiate collectively. "This means that the esma can be evoked if they go on a strike," says Prsahant Bhushan, a senior Supreme Court advocate. sezs are also exempt from the Contract Labour Act, 1970, and the Factories Act, 1948. Also, in keeping with the principle of a single-window clearance, all the powers, duties and functions of the labour commissioner will be delegated to the development commissioner. Bhushan added that essentially this will mean that employers in sezs can do whatever they want without bothering about sparking off a public uproar. Giving teeth to fairly arbitrary powers, hidden under the voluminous sez Act, is a potentially dangerous stipulation (section 49), which gives the central government the power to exempt sezs from any other central act, notification, rules or regulations, through a notification. Thanks to the Left parties' intervention, however, the draft was changed to include a condition specifying that section 49 will not apply to matters of trade unions, labour disputes, work conditions and workers' welfare. Does this mean that these enclaves can be beyond -- labour issues aside -- the purview of the laws of the land? "I haven't seen such a clause anywhere before. It's a clear case of excessive delegation of legislative power. 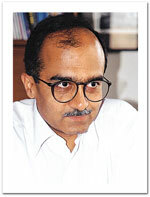 It is clearly unconstitutional and a very unusual power is being given to the executive," Bhushan says. It's not just a question of the laws of the land by conferring almost plenipotentiary powers on the development commissioner -- the designated administrator -- the sez Act short-circuits democratic processes. There is no role for elective bodies in these enclaves. Moreover, observers apprehend, there could be a corridor of uncertainty as far as the commissioner's position is vis--vis the government, on the one hand, and the developer, on the other. Despite all this, the sezs will come up. Prime Minister Manmohan Singh has announced that these zones are here to stay. But no one has yet provided anything more than a ballpark estimate of what the sezs will mean to India. " 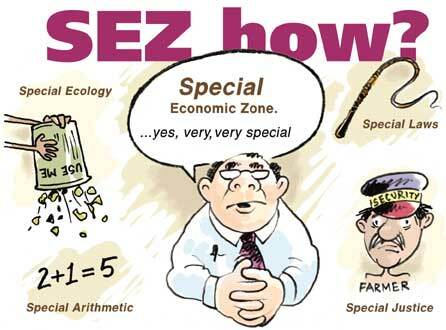 epzs are the most we know about sezs. 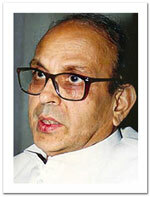 It is impossible to estimate anything more," says Debroy. "You are taking resources from the poorest people and giving them to the industry to create enclaves for fiefdoms. It's a myopic plan, politically and otherwise. There will be a severe backlash from the people," says V P Singh. A backlash is evident for sure but how far that will be effective given the seeming resolve of the current dispensation is debatable. The odds are stacked in favour of the new industrial nabobs.